[News from the News Center] On Mar. 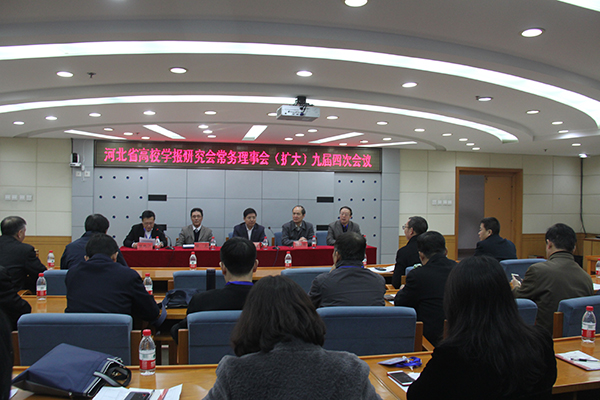 29, the 4th session of the 9th standing council of Hebei university journal association (the association) was held at the lecture hall on level 18, Century Building, YSU. More than 40 representatives attended the meeting including executive members of the association and members of the working committee. The opening ceremony was presided over by Zhang Chunjiang, Director of YSU Periodical Press. Zhao Dingxuan, Vice President of YSU, gave a welcome speech on behalf of the university. Zhao introduced the general situation of the university and YSU journals, and hoped that the all colleges and universities would enhance communication and exchanges to get improved together. Liu Shuchuan, Director of the Science and Technology Office of the Hebei Education Department, affirmed the work of the association in recent years and put forward some thought about the gap between the university journals in our province and those in other provinces. Ren Huo, Director of the consultative working committee of the association, highly evaluated the positive role of the association and raised expectations for strengthening the quality of editors. In the academic discussion session, Zhao Zhiwei, president of the council, arranged the preliminary evaluation and recommendation in Hebei Province for excellent journals, excellent editors and excellent editorial works organized by the China University Social Journal Society. Secretary-general Yang Jicheng, Vice President Song Fengxuan, Xu Yongbing, He Xinsheng, Wang Wenzhi introduced and explained the announcement, procedures and requirements of the evaluation. Yang Huasheng, vice president of the association, introduced the new election of the Society of China University Journals. Dong Mingwei, editorial director of the Journal of Yanshan University (Philosophical and Social Science Edition), made a report on the establishment of the “column of classification translation”. Secretary-general Yang Jicheng introduced the construction of the association website. This meeting helps the editors to fully understand the development trend of university journals, and has a positive effect on strengthening the exchange of university journal editors in Hebei Province and promoting the construction of high-level academic journals.